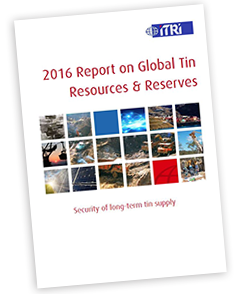 This report presents ITRI’s estimate of global tin resources and reserves at the end of 2015, with commentary and outlook for the important tin producing regions of the present, and potentially the future. As calculated by ITRI, the world’s reported tin resources at the end of 2015 totalled some 11.7 Mt, including 2.2 Mt of reserves. 3.4 Mt of resources (29%) and 0.6 Mt of reserves (27%) were compliant with the CRIRSCO reporting standard. The top 5 countries as a proportion of compliant global resources were Australia (24%), Brazil (16%), Kazakhstan (14%), Germany (8%) and Peru (8%). When non-compliant resources are included, the top 5 countries change to China (35%), Russia (12%), Australia (8%), Indonesia (7%) and Brazil (6%). When considering these defined tin resources and the potential of unreported and undiscovered tin worldwide, it is clear that there is enough of the metal to satisfy global demand long into the future. However, many defined tin resources will require higher tin prices or more efficient extraction technologies to be economic for development. The current low tin price is a risk to tin supply over the next 5 years due to reduced investment in tin projects. It is important to clarify that this short term supply risk results from a stalled project pipeline and not the long term availability of the metal in the ground.